I tried to apply once for monetization (Settings > Monetization) in YouTube. If you don't find the Monetization panel after clicking Settings in your YouTube account toolbar, your country is probably where YouTube Partner Program is not available, that's why I chose Singapore as Country in my channel setting. However I put Penang, Malaysia as Location, proving that I didn't forget my root. Despite that, I failed and was told that my channel has insufficient viewership. 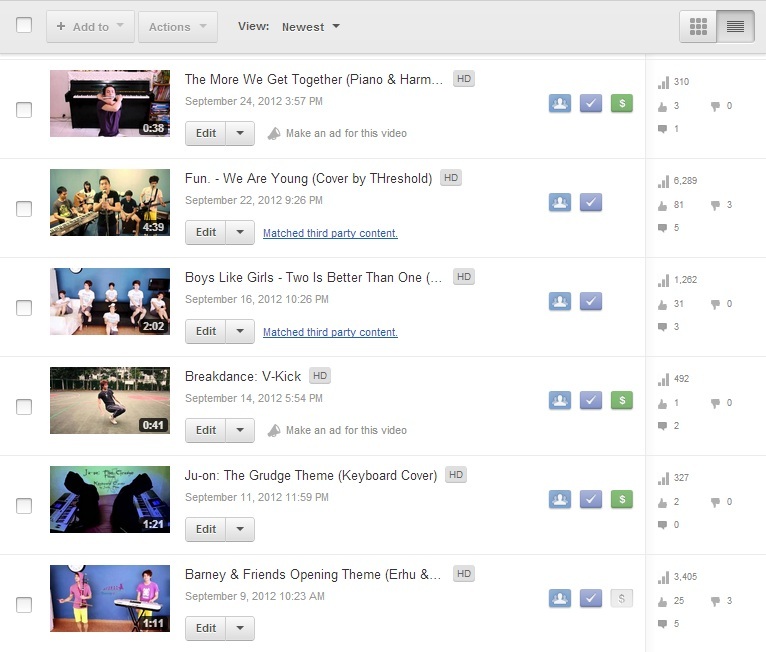 I guess it was at the point of time when I haven't even uploaded a single instrumental cover videos. In the meantime when I go back to Monetization, there was no option for me to enable monetization but just a sentences saying Monetization is available in your country, which is just crap because even when I changed to Japan, it doesn't work. Then I found out that there is a 2-month period which I can't apply from the date of the unsuccessful application. Nothing has changed even in October and I am sure that that was already more than two months counting from the day I first applied. Well, it seems to be easy, so I'm not sure whether anyone can do that right now, you might want to try if you have a YouTube account with videos. I went to my Video Manager and I noticed the difference - the extra green monetization buttons. Apparently those videos that Matched third party content are not eligible to be monetized. Whether I am a YouTube Partner or not, I wondered, when I found no way to customize my username above my video, and the extra 150px apace on top of my channel. But I remember the phrase I saw on YouTUbe after enabling monetization - You will become a YouTube Partner when you have at least one of your video monetized. Having a few videos of mine currently monetized, I guess I can declare now that I am officially a YouTube Partner! Well, I better don't yell too loud, as becoming a YouTube Partner easily could become a norm. About the customizable stuffs, I guess the YouTube Partner has to be prominent enough to be like a "Business Partner" of YouTube. Being able to monetize videos is not the end of the story yet, to get paid, I have to associate my AdSense account to YouTube. I don't really expect to get paid by the way, as my viewership is way too far from presentability. Oh dear, talking about AdSense, I have a longer story to tell, where some unknown factors lead to the disapproval of my AdSense account. I called Google Singapore this afternoon, without having a chance to even speak to the operator, I was told by the 'automated answering officer' that issue about AdSense is currently not possible to be solved through phone call and I was asked to send email to adsense-support@google.com. This is actually not bad, as you won't be able to reach Google easily because they encourage you to post questions in their Google Product Forum, claiming that their Google Team will take a look at those queries. Right, I did so a few months ago and I didn't get a single reply. Hi, I called Google Singapore this afternoon to seek for assistance for my AdSense account and was asked to send this email because issues about AdSense is currently not able to be sought assistance for through phone. Quite some time ago (more than a year ago), I applied for AdSense for my blog in Blogger (javintham.blogspot.com) by using the URL of my blog and always being rejected because of domain ownership (which I don't really understand why because Google Ads are supposed to be able to display in Blogger), and even after I tried to create a page in Blogger and obtain new URL like javintham.blogspot.com/p/domain-ownership, I still didn't get approved. And ever since Blogger has an updated layout I've never tried to reapply, until last few months. In Blogger, I went to Earning, and click on "Get Started", at the Link your AdSense account panel, I was shown "Your AdSense account has been disapproved for a Terms and Conditions violation. View the AdSense Terms of Service." I honestly do not know what Terms and Conditions have I violated. and by using javintham.blogspot.com in the field "I will show ads on", I couldn't proceed and was asked to "Please register for AdSense directly from blogger.com.". Fine, then in Blogger, I go to "Earnings" and select "Get Started", the same thing happens again as explained above. Few months ago I actually posted this issue onto the Google Product Forum (http://productforums.google.com/forum/#!mydiscussions/adsense/OEjQJAYAP-0) but no one has replied. The 1st one does not work because it says that "The specified email address is already in use. If you own this AdSense account, please go back and choose 'Use Existing Account' instead." I supposed it means that the email address for my YouTube account is the same as my AdSense account, as well as my Blogger account. Hence, I have to go with the 2nd one. For the 2nd one, when I type my email in, it says "The AdSense account for this publisher has been disapproved. We do not allow requests on a disapproved AdSense account." In short, I need an approved AdSense account. Finally, I hereby seek for your assistance regarding this issue. I cannot reapply as I cannot use my website from Blogger to apply as it will direct me back to Blogger. I hope that Google can reset my AdSense account so that I do not have to apply an AdSense account by having my own website but able to apply directly from Blogger or YouTube, because I do not think I have violated any Terms and Regulations for AdSense except for maybe using the Blogger URL (javintham.blogspot.com) that I used to apply for Adsense that made Google think that I am using a domain that does not belong to me, as previously Blogger did not have the function of applying AdSense directly through Blogger itself. I deeply appreciate for understanding my current situation. Hope to hear from you soon. I hope the relatively long email above sort of summarizes the problem I faced with AdSense. And ya I have a cool email signature, haha! To sum it up, if I am one of the few YouTubers that are recently eligible to monetize videos, I would like to thank YouTube for recognizing my effort.